Childhood trauma was always going to play a large part in a project like this and in that regard it’s a particular treat to see the unique voice of Lizz Lunney in these pages. 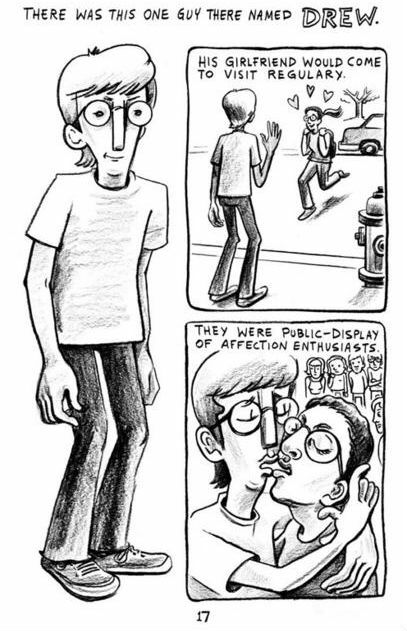 So much of Lunney’s work revolves around human nature and the awkwardness of social interaction, but it’s usually removed one step from reality on the page by her use of comedy avatars. Here, Lunney provides some more obviously autobio/first person material than we are used to from her, including a moment of parental blame-shifting from her younger years that will have your jaw drop in sympathy! Her ‘Diagram of Embarrassment Levels’ – ranking everything from tripping over your own feet to getting a tattoo in a different language that doesn’t mean what you thought it meant – is pure classic Lunney and can also be viewed online on her site here. That element of juvenile humiliation continues as an intermittent recurring theme throughout the book. Adam Pasion’s ‘Eye of the Beholder’ revolves around the experience of accidentally injuring a young peer and will strike a chord with most readers. 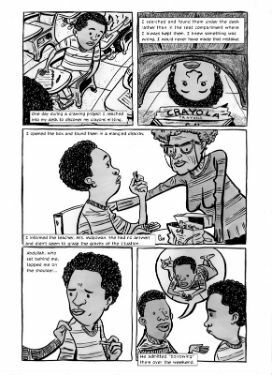 Fred Noland’s ‘Crayola 64’ – centring on his memories of proudly taking his new crayon set to school – is an evocatively cartooned, heart-rending recollection of the cruelty of kids, and of the pain of an event in our past that we can never stop seeing through childhood eyes. And Delaine Derry Green gives a catalogue of sigh-inducing parental treatment in ‘Mother Knows Best…’ that will resonate with many – from having her diary read by her mother to a surprise 18th birthday party being ruined by casual maternal revelation. Many of these shorts are about comic timing, building up to a situation or a “punchline” of sorts that can range from the blatantly telegraphed to the completely unforeseen. Some of the most intriguing entries, though, are longer-form work. Chad Woody’s densely constructed ‘Living with Steve’ about a living companion who redefines the concept of “the housemate from hell” is one of the standout strips. Similarly the retro underground stylings of ‘Danielle’ by Jamie Vayda and Alan King tells the story of a relationship that is the absolute embodiment of an accident waiting to happen and will have you unsure as to whether you should really be raucously (but guiltily) laughing out loud at its denouement. I was also particularly taken by the comedic pacing of J.T. Yost’s ‘Purple Rain’ and his adept use of those unique storytelling properties of the comics form that I talk about so frequently in this column. It’s an uncomplicated story, certainly, but it’s one of the highlights of the book by far and one that I don’t want to spoil at all by over-elaborating on here. You will have to trust me that it’s a gem of abject humiliation and unremitting shame, set at the onset of a possible new relationship. 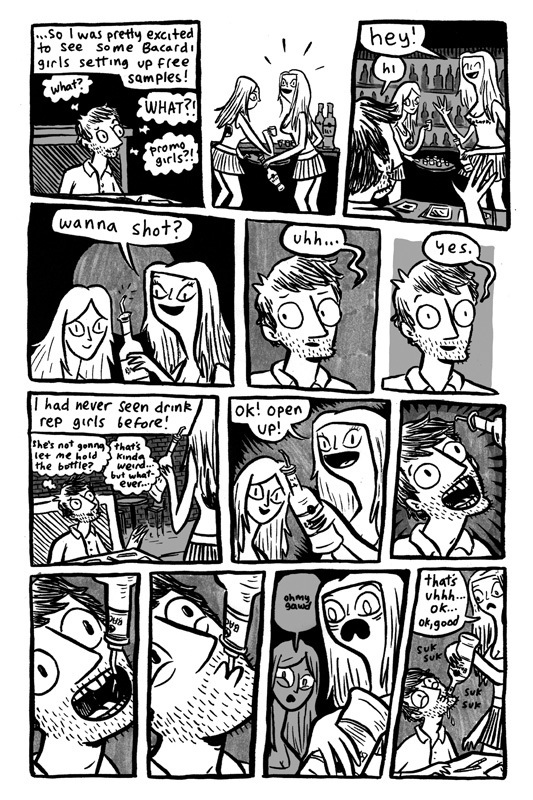 Not every artist looks to the potential humour inherent in Cringe’s remit, though. 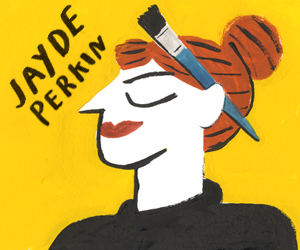 Cara Bean – whose wonderful Ms. Bean’s Art Class I reviewed here at Broken Frontier last year – uses ‘The Darkroom’ to recount a creepy and unpleasant incident with a fellow student on a photography class that will evoke feelings of anger in the audience. Look for some very inventive use of camera-themed layouts in this one. 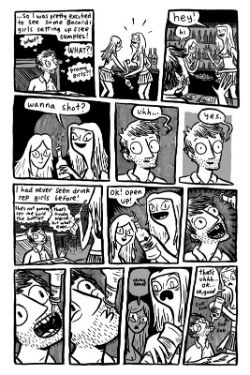 Victor Kerlow is another creator to approach the Cringe theme from a different perspective. Regular ‘Small Pressganged’ readers may remember I reviewed Kerlow’s Everything Takes Forever from Koyama Press a while back here. His ‘Hey Man, Spare Some Change?’ – detailing a young homeless man’s heartbreaking willingness to degrade himself for a small amount of money – is rendered all the more touching by his constant “to camera” panel positioning. I have merely touched on all the creators involved in this book but, suffice to say, it’s the personal element of so many of these offerings that will make you recoil and wince in sympathy (or not!) as you read them. We obviously have no idea what level of dramatic licence the creators are using, of course, but it’s that knowledge that every story we encounter here very probably happened that makes them so painfully entertaining. 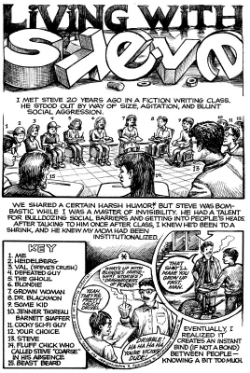 Yes, one or two have elements of the familiarly anecdotal, or a feel of pop cultural appropriation, but there’s also so much material here to make the reader flinch in empathic discomfort – inadvertently appalling bar etiquette, near underage romantic liaisons, toiletary calamities, mistaken identity and many other moments of crushing social disaster. 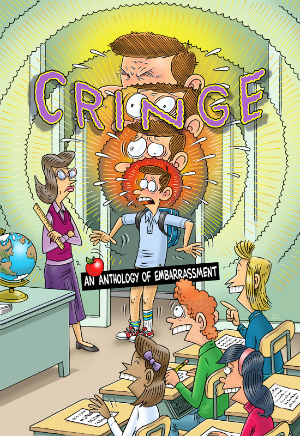 Cringe: An Anthology of Embarrassment is edited by Peter S. Conrad and published by Birdcage Bottom Books. 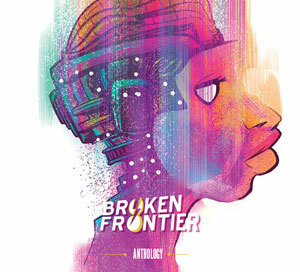 You can order a copy here priced $8.00. Sounds great, just what I need for a laugh!